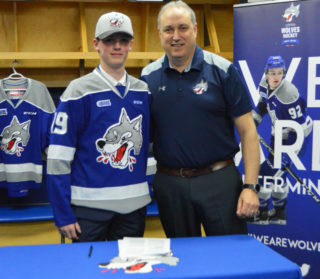 The Sudbury Wolves travelled to Kitchener on Friday to take on the Kitchener Rangers. The Pack were looking to continue their winning ways on the road, having won their last four straight. Despite controlling most of the game, the Rangers capitalized on their powerplay opportunities and went on to win the contest by a final score of 4 – 3. The Rangers jumped out to an early 1 – 0 lead in the first period on a powerplay goal from Matia Marcantuoni at 12:19. The Wolves responded with a powerplay marker of their own at 17:27 of the opening frame with a goal by ANDREY KUCHIN (MICHAEL SGARBOSSA, JOEL VIENNEAU). Just 1:40 later, the Wolves took a 2 – 1 lead after a beauty goal from SGARBOSSA (unassisted), for his 7th goal of the year. The Wolves came out strong early in the second period but it was the Rangers who managed to regain the lead with the tying goal from Ben Thomson at the midway point of the frame, and a powerplay marker from Tobias Rieder at 14:49. The Rangers lead 3 – 2 at the second intermission. The Wolves applied the pressure again in the early going of the third period and KUCHIN scored his second goal of the game in the opening minutes of the frame to tie the contest 3 -3. The Pack continued to look to regain the lead, and were ahead 9 – 1 in shots but were just unable to solve Rangers netminder Franky Palazzese. The Rangers once again took advantage of a powerplay opportunity midway through the period when Radek Faska scored his 9th goal of the season – which proved to be the eventual game winner. Joel Vienneau made his first start in goal and had a strong outing – making 29 saves for the loss, while his counterpart Palazzese made 37 saves for the win. Andrey Kuchin was named the game’s 2nd Star. The Wolves will look to rebound on Saturday night as they travel to Guelph to take on the Storm. Game time is 7:30pm, and you can catch the live call from Stew Kernan on 95.5 KFM.